Woke up about 7:30 Jim already had coffee made. I made a great breakfast with leftover stuffed French toast and peach crepes, from the I Hop last night. I also made eggs and I had 3 mini pancakes in the freezer I had made for the Grandkids, and it sounds weird, but I had 2 leftover hotdogs we had too. was really good. I had some wraps I made for a quick lunch on the road. I put chicken, tomatoes, mayo, BBQ sauce, cheese. We packed up and left at 9:53. He had to make a big u turn to get out of here. 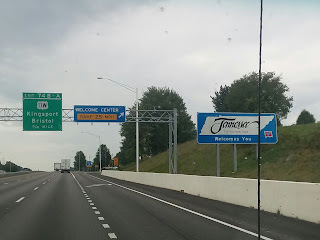 We got back on 81 South and drove over 2 hours. We kept having light rain on and off, never really got to heavy. Found a Petro truck stop, we filled up then parked in a big spot and had our quick wraps, protein bar and a Pepsi. Got back on the road and in just a little over 2 hours from then we were HERE, yea. We checked in Jim got some beer and we were set up. 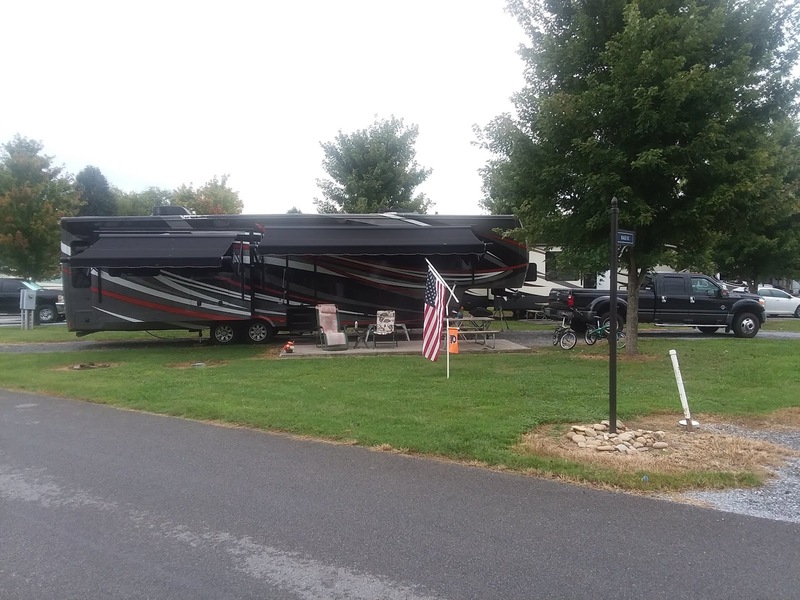 We picked out our spot a year ago when we were here for an RV Dreams Rally. They have very level sites so that didn't take long. We are getting quite good at fast set up. He does outside, I do inside. I said It is amazing how quick I make the inside look like we never left. Then I called Direct TV to change our address to local TV channels. That took 12 minutes. Now all set for the new shows starting this week. I made dinner around 5:30 I heated up a couple burgers Jim grilled before we left, turkey for me 2 beef for him. And white chicken chili soup, I had 3 bean veggie chili I made both in the Instant Pot. Then we got our new bikes out and after Jim fixed the chain that came off my bike it was bent, and put air in a tire we were ready to take a ride. They did get quite scratched up in the back of the truck. It was fun to see all the Lifestyles here like ours. The group was having a camp fire so we walked up with our chairs and met some people Sara and Tommy. There are something like 96 couples here. It started raining a little, was after 8 by then, so we walked back and took showers and got ready to watch The Voice, Jim talked to a friend he used to work with, then he went outside to talk with someone else, I made popcorn watched TV and went to bed after 11.